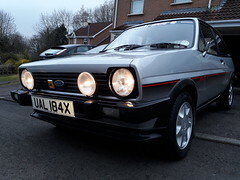 Just after a bit of advice have booked the mk2 in for some welding to a very reputable local body shop that specialises in classics. They have quoted me £450 a side for both inner and outer rear arches to cut out the old welding in the new, fill, smooth and prime. I just wondered wether this is a reasonable price considering I've seen some of their work and it's top notch and how long (after I've painted it) should I expect it to last? I know for that price I could get a half decent shell but the car has been in my family for many years so very attached it it! The rest of the car is OK but could do with the odd jobs here and there. Mk2 1.1 daily driver, love driving car older than me! I'd say it was expensive. If they do a really good job it should last. Ask them what primer they use. You could get it done a lot cheaper. I've had cheap repair jobs done before. It doesn't always work out for the best. They have done a few mk2's before they also have a Facebook page and post up all of the projects and I've seen them on there, they always seem very busy too so just hoping that they last. Seem to do a lot of full restoration projects. They can even make their own panels apparently! I had a cheap rear sill job 5 years ago which has lasted until now. Someone I used to work for was going to do it for me in a week but kept fobbing me off woth excuses I found out he had it sat in his field for 10 weeks! Nearly knocked him out! You pay for something to be done.. It's usually done. If it's a "mate" .. Unless it's actually good mate.. Be prepared to be let down or it to take a while. Sounds reasonable, it'll easily take a day to do each side to a high standard. £450 per day for the services of a proper craftsman to do specialist work like car body restoration is reasonable. I don't thinks its too expensive at all, probably more than a day per side to do its properly. That's about what you'll pay for three days work, also considering doing the rear arches is probably the hardest part to replace on these cars. These places generally charge 25 - 30 quid an hour. So do the maths. Works out roughly 18 hours work per wheel arch at £25 an hour. Assuming it is that , was when I had work done 2 years ago at a classic specialist bodyshop. So 2 days work per arch. Sounds about right. 25-30 quid an hour for welding ! Its not worth opening your tool box for normal spanner work at that price let alone striping a car out and welding it. I'm obviously a cheap skate! In retrospect, it's probably a reasonable price. Still ask what they use as primer though. If it's epoxy, snap their mitts off!